Good Tuesday morning friends! Tuesday, on the blog? I know!!! My normal blogging days are Monday , Wednesday and Friday but I have so much to share with y’all that you’ll most likely see me here every day this week!! Today I wanted to hop on and share our new wireless light we put up in the entry way! I absolutely love it and I hope y’all do too! It helps solve the ‘old house/few lights’ obstacle in our home! So if you read my Winter Home Tour yesterday, you saw that this time of year is when I like to give our home a little refresh. Nothing crazy, I just like to switch around décor and freshen up a couple of spaces. Well…one space that I’ve had my eye on is our entry way table and the framed shiplap I made a couple of years ago. It needed a change but I wasn’t sure in which direction, I actually had the thought to take down the framed shiplap all together until I got the idea to do something else with it. (I’ll be sharing that idea in a later post once this project is finished!) One thing I knew I wanted to change was the lamp on the entry table but we needed some source of lighting in this space. And then I saw a fellow blogger (Nestingwithgrace) do these battery operated scones and I was sold! The light I chose for this project is from Lowes. 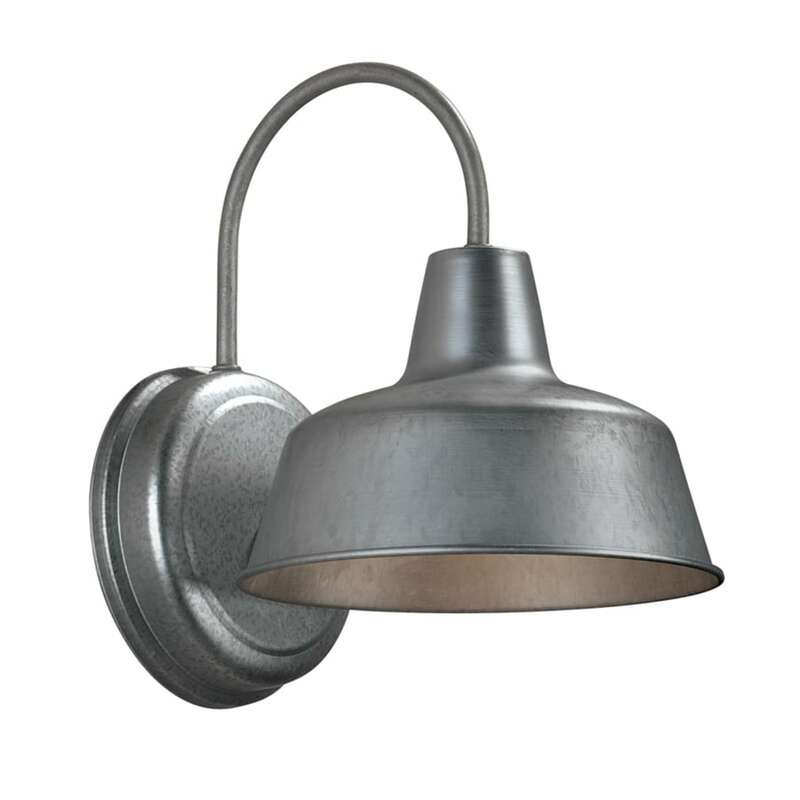 It’s the Portfolio Ellicott 10.75-in H Galvanized Dark Sky Outdoor Wall Light. (You can find it here) I knew I wanted it to be black to go with the other parts of this little refresh so I used Rustoleum in flat black to paint it. Officially obsessed! To mount the light to the wall we used the hardware piece that came with the light. My husband marked the spot for our light and then drilled holes to place wall anchors and screws as shown below. It was really very simple to attach to the wall. Once we had the hardware in place the light would simply slip onto the bolt and we’d tighten it down using the nut that also came with the light. I really love how this little light changed the look of our entry table and I can’t wait to get this space complete! The fun part about this light project is that it costs right around $50 (light fixture, set of three lights and a can of spray paint). We had two of the puck lights left over and we were actually able to use them in a closet and also under one of our kitchen cabinets so this project actually stretched a little bit further! I hope y’all enjoyed this little DIY for today. As always if you have any questions please leave them in the comments section below or email me at misdiy@outlook.com! Also, if you try this DIY in your home I would love to see it!! Email me pictures or if you are on Instagram and you share, tag me @misdiy! Feel free to use the image I’ve provided below to pin on Pinterest for keeps! Do you have a pic of it lit? I did share a photo and a link for the light in my post.